So it’s time to leave the Little House and tear him away from several days of precious Pottery Barn living and Angry Birds on the Kindle at odd hours and foods we don’t normally eat at home, like grated-cheese-and-nitrate-free-bacon-quesadillas-for-breakfast-with-1-maraschino-cherry-on-top, and return to the pre-K routine and pre-Spring scorch that is the Ponderosa—and gakking cats and dust-layered patio furniture that also, without fail, comprise the Ponderosa—and the dog’s paws squashing bare feet and his sausage-body slamming you to the ground and the unicycle that still needs mastering and that stunning pink sky at twilight, marked by cypress tree points and dubiously strung power lines and absolutely nothing Pottery Barnish-precious that are, also, the Ponderosa (saying farewell to the sea is so very bittersweet for this writer). After a weekend of record March highs, the morning’s woolly clouds and a cold breeze make a last beachwalk unwise, freaking me (how can I not say goodbye to the ocean even though I hate saying goodbye), but I glance up and there are those cinematic mountains all purply and inviting in the gloom. So I zoom us to the botanical gardens and from there, that high, amidst Mission Canyon oaks, we look down on placid blue studded in Santa Cruz Island and we both, I swear, utter the awed ‘Ohhhh!’ you hear only from those totally overwhelmed by nature. We are surrounded by wildflowers and ponds and succulents and giant, gangly Dr. Seuss growths and, after giving each other a wink, instantly having fun. 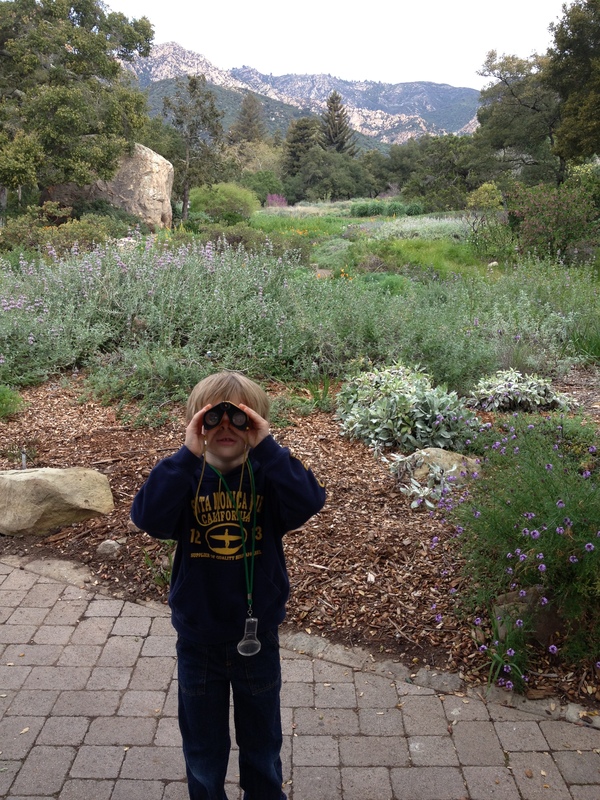 Especially since the docent hands him a magnifying glass and a pair of binoculars to wear around his neck. That’s what I’m talking about, Mama! he declares and sets off along a trail lined in blooming cacti in search of ‘clues’. Bye, bye, I tell the ocean, glancing at my buzzing cell phone. It is my husband, calling from our (dusty!) desert oasis that is the Ponderosa and which he is tidying in our honor, eager for our return. This entry was posted in Children's Books, dog, Fiction, Me and Us, ocean related, Poetry, Santa Barbara, Writer's Angst, Writing and tagged 2013, angry birds, beach, dog, Dr. Seuss, fiction writing, Kindle Fire, labrador, middle grade writing, ocean, personal goals, poetry, preschoolers, Santa Barbara, writer, writing. Bookmark the permalink. Oh, what a fun weekend!! I marvel at all the wonderful things you do with the boy and always (lovingly) wonder “why do I not come up with these amazing ideas?” and “how does she know about all these awesome places?” Yes, this my friend, is why we should plan a play date soon. The boys play, we sip and chat. ‘kay? Marieke–you’re on. And most of my amazing ideas live 75 miles North of us, so it’s a bit of a drive…We’ll have to plan a Northern outing. They are magical. Your beach posts make me want the beach. Every. Time. And every time you write about the boy, it makes me want to hug my kids even tighter. Thanks for the beauty, PB. Thanks, Beth. Not looking forward to the perpetual heatwave that is summer, fall and winter in this valley.